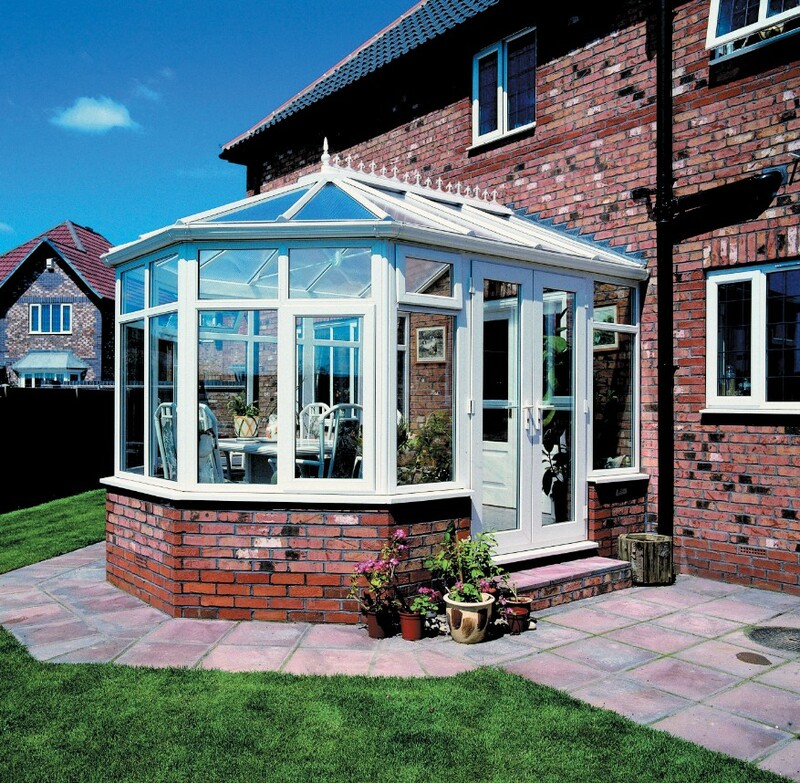 The standard Victorian DIY conservatory is traditionally the most common conservatory style to be installed. Having been developed during the Victorian architectural period these structures were designed to complement the Victorian bay window. One must carefully consider the furniture layout in this design as a small Victorian conservatory, because of the facets, limits the positioning of larger sofas. Having said that the Victorian design is still aesthetically pleasing and is still a popular choice by home owners. 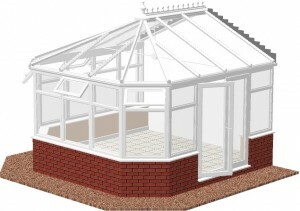 In the standard Victorian design the front facet are always equal to allow for ease of roof fabrication. 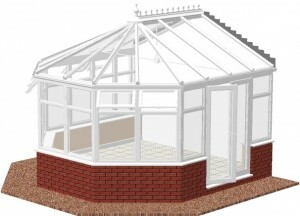 The five facet Victorian DIY conservatory is not a common choice of conservatory style. On some period properties it can appear to be the perfect option but the rounded front again limits the way you position your furniture unless it is a large conservatory. The parameters used when designing this style are about five meters in width and about five meters in projection. Another consideration when designing this style is try and keep the frame sizes even as the outer brick sizes will determine the frame widths.The illustration is of a four meter by four meter conservatory and even here the facet frames are wider than the straight sections. The wide front Victorian DIY conservatory is the most versatile in the Victorian range. The width of the front elevation can be specified so the facet sizes will be determined by this dimension. This style is the most practical in the Victorian range as it allows furniture placement in much the same way as the Edwardian design, but keeping the softer rounded corners that are quite pleasing to the eye. 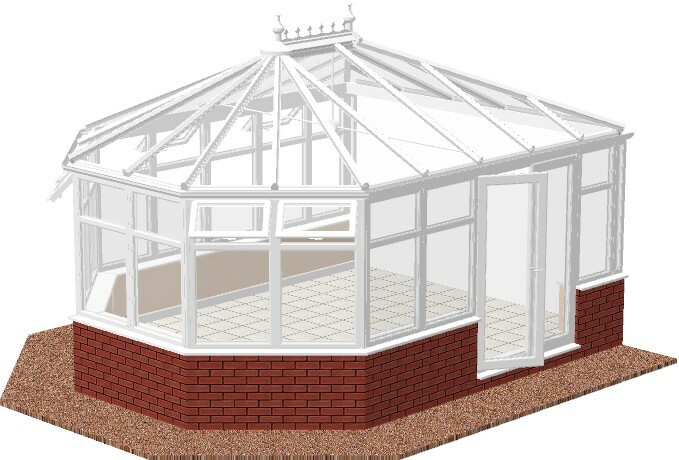 Because you can specify the dimensions of the front facets, it is possible to place the doors on the corner and create a further interesting feature in the conservatory. This style of Victorian conservatory design is a relatively new and practical concept. 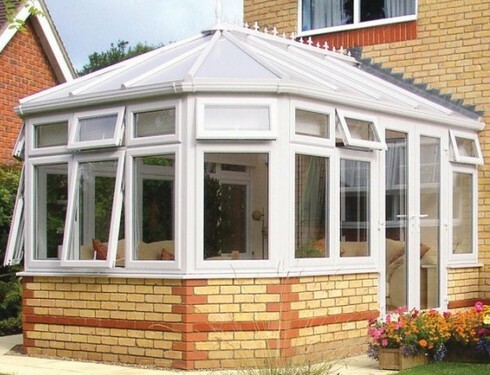 The reverse drop Victorian DIY conservatory was designed to overcome height restrictions and building onto bungalows. The design was created for period properties with architectural features such as stairwell windows or corbelled brickwork above ground floor windows and doors. The roof is supported by a structural aluminium box gutter that is attached to the host wall. The projection of this particular style should be far greater than the width to allow the roof structure to look pleasing to the eye. A point regarding the box gutter. It is an obvious trap for leaves and debris and should be cleaned on a regular basis. This is a simple operation. You can use your hose pipe to to flush the debris into the down pipe or if the buildup is to much to clean it out with a broom. The box gutter is structural so will hold quite a weight. “The Office” 23 Brereton Drive, Nantwich, Cheshire CW5 6HE.